Here at Ivershin we offer a real Highland welcome! Here at Ivershin we offer a real Highland welcome! 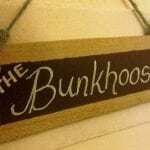 We offer comfortable en suite rooms within the hotel, we also have a bunkhouse that sleeps up to 10 people. If neither of those take your fancy we also have 2 Glen Lodges where each lodge sleeps 2-4. Visit our website to find out more.